We supply the widest range of double glazing products, Styles and Finishes throughout Ashby-de-la-Zouch. Our double glazing doors are of the highest quality and come in wide range of styles and colours to ensure that no matter what your requirements we have something to suit your needs. We understand that all doors should provide exceptional security. That’s why all our Entrance Doors have high security locking systems to Police preferred security specification and carry the prestigious ‘secured by design’ accreditation to all Entrance Doors. All Classic residential doors are fitted with the revolutionary Vectis 5 Lever mortice lock. This advanced locking system combines the traditional mortice lock with the advantage of multipoint locks to provide the next generation in locking technology. 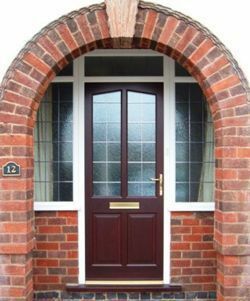 This way you can be sure that when you buy an entrance door from us, you are not only buying a beautiful improvement to your home but also a secure improvement that will help to keep your house secure. For more information or for some prices for our Double Glazed Doors in Ashby-de-la-Zouch then Contact Us direct today. Call us on 01332 371883 or alternatively fill in our Online Enquiry Form.